We've received several random questions about tires and tubes recently, so we decided to combine them to make this month's TechTalk column! Q. Why are there two kinds of valves on bicycle inner tubes? A couple points of clarification that we'd like to add... Sometimes you'll see abbreviations for the valve types on inner tube product packaging: "PV" for "presta valve, " but also "FV" for "French Valve" or "RV" for "Racing Valve" instead. You may see "SV" for "Schrader Valve, " but sometimes called "AV" for "American Valve." When asked what kind of valves you need for your tubes, the answers "regular" or "normal" are not useful, because the words "regular" and "normal" don't mean the same thing to every person! Someone familiar with car tires and hybrid bikes would consider the Schrader valve "normal," but somebody more used to racing bikes would consider the Presta valve "normal!" Q. Should I rotate (i.e. swap) my front and rear tires occasionally so that they wear evenly? A. No. While it is true that your rear tire bears more of the weight and friction and thus wears out more quickly, you should always have your best tire on the front, because that is most important when it comes to having enough steering control in potentially dangerous situations, such as cornering and descending. Q. When installing a tire on a wheel, is there a trick to getting that last little bit of tire over the edge of the rim? Why are they so hard to put on, and how can I avoid pulling my hair out in frustration every time? A. We feel your pain. Some tire/rim combinations are harder than others, even two tires labeled as the same size, due to minor variations in design and manufacturing tolerances. Bike shop mechanics have built up their thumb muscles from having done this process several times a day over the years. Skinny road bike tires tend to be the worst. Your best bet is to practice at home when you're not under the pressure of trying to finish a ride (and maybe do push-ups on your thumbs?). You can pick tires that are more loose on your rims, but as always, there are trade-offs to consider. You want the tire bead to be loose enough to be easy to get on and off of the rim, but you don't want it to be so loose that the tire comes off of the rims on its own should you get a flat tire while riding. Especially while going down a hill very fast, the tire coming off of the rim can result in a very quick and dangerous "involuntary separation" of you from your bike. Our step-by-step guide for How To Fix A Flat Tire (http://centurycycles.com/page.cfm?pageID=714) contains many helpful hints for making the process easier. Of course, having the right tools helps, such as the Topeak Shuttle Levers, KoolStop Tire Bead Jack, or Crank Brothers Speed Lever. Q. Do skinnier tires roll faster than fatter tires? Taking the basic no-brainer case of a smooth, skinny road bike tire vs. a fat, knobby mountain bike or hybrid tire, then yes, the skinny tire will be noticably faster. Where it gets complicated is when you reference a couple of studies that have been done to compare the efficiency of differing widths of tires. These studies are controversial, as some people question the testing methodologies used. Whether you believe them or not, the basic conclusion of these studies is that all else being equal, skinnier tires are NOT faster than fatter tires. The key phrase in that conclusion is all else being equal. The catch is that all else is rarely ever equal. Stated another way, you could say that two tires with different widths, with the same weight and tread pattern, pumped to the same pressure, will roll at the same speed. However, very few manufacturers make tires that come in different widths, but with the same tread pattern and same recommended pressure, and if they do, the difference in width will make them weigh slightly different, so it's never possible to perfectly compare apples to apples. Suppose you compared two of the same model tire in different widths, say the Continental Ultra Gatorskin in 700x23 (weighing in at 300 grams) and 700x25 (weighing in at 320 grams). Both have a maximum recommended pressure of 120psi. Put the 700x23's on your bike and go for a ride, then put the 700x25's on and ride the same route. You may not notice any difference at all. Whatever size you tried first might feel faster because you are not as tired at the beginning, or you might feel faster on the second set because you are good and warmed up. Or, you might get on the 700x25's and think (whether consciously or unconsciously) "Hey, these feel more secure and grippy!" and that feeling will make you ride more aggressively, tapping your brakes less on the turns and descents, thus making you faster overall. These uncontrollable physiological and psychological factors make an ojective comparison impossible. Your best bet is to ride the size of tires that feels the most comfortable and efficient for you based on your own experience, and don't obsess over a few millimeters here and there. We like to go with wider tires for the improved comfort and traction. 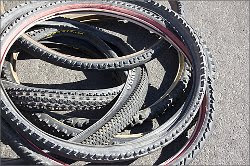 Check out this previous TechTalk: Why All The Tires Sizes? for a discussion of what all those numbers printed on the sides of your tires mean. I guess I need to work my thumbs out. Kevin -- have you seen this wheel? What wheel are you talking about?